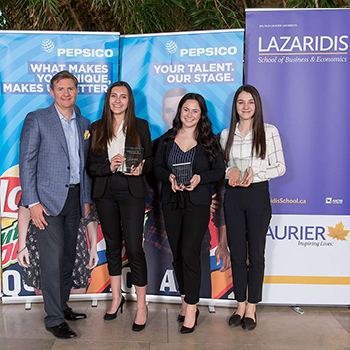 On Friday, Feb. 8, the Lazaridis School of Business and Economics hosted the 10th annual PepsiCo Pitch Competition. The top 80 out of nearly 1,000 first year BBA students pitched their new venture idea to a panel of industry judges in the hopes of earning an interview for a summer position with PepsiCo Canada and scholarship funds. All first year BBA students presented their individual pitches in their BU121 labs. The top two students from each lab advanced to the semi-finals where they presented to teaching assistants and alumni judges. The top 10 presenters from the semi-finals were then invited to present to a panel of industry judges including: Jason McDonell (BBA ’96), President, PepsiCo Foods Canada; Val Del Hierro, Director of Business Development, PepsiCo Foods Canada; Andy Siklos (BBA ‘86), President, Aramark Canada; Melissa Durrell, President and Chief Communications Strategist, Durrell Communications; and Greg Barratt (BBA ‘80), VP, Strategic Growth Team, Communitech. Students were given just two minutes to pitch their business ideas. New venture concepts included custom online shopping avatars, noise-cancelling headphones for lectures, a printer that can unprint documents to save resources, a multi-use sport stick to reduce costs of participating in activities, and glasses with interchangeable frames, amongst others. The quality of the student presentations really impressed the judges. Before the winners were announced, students had the opportunity to hear from alumnus, author, and former Dragon, David Chilton (BA ’95) who shared some of his Laurier experiences, some highlights from his career, and his encouragement for this next generation of entrepreneurs. He called the PepsiCo Pitch Competition a “highlight of the year” and congratulated everyone on the quality of their pitches. Thank you to the TAs for your mentorship, guidance, dedication and commitment to success. Thank you to PepsiCo for your commitment to our program and our students through your hiring programs and events like this. Thank you to our panel of judges for your time, support, and valuable feedback.